Alentejo ( ) is a south-central region of Portugal . Its name's origin, "Além-Tejo", literally translates to "Beyond the Tagus " or "Across the Tagus". The region is separated from the rest of Portugal by the Tagus river, and extends to the south where it borders the Algarve. Alentejo is a region known for its polyphonic singing groups, comparable to those found on Sardinia and Corsica . Its main cities are Évora (region's capital), Santarém (formerly belonging to Ribatejo region), Portalegre , Beja, and Sines . Being a traditional region, it is also one of the more recent seven Regions of Portugal (NUTS II subdivisions). Today Lezíria do Tejo subregion, formerly belonging to Lisboa e Vale do Tejo region, is part of Alentejo NUTS II region. Topographically the countryside varies considerably, from the open rolling plains of the south of the Alentejo to the granite hills that border Spain in the north-east. To feed the water needs of this considerable area a number of public dams have been constructed, most notably the Alqueva Dam . 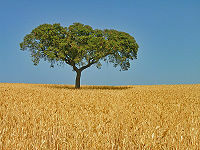 The landscape is mostly one of soft rolling hills and plains, with cork oaks and olive trees, or the occasional vine. In the north agriculture is based mostly livestock-based, with as cows, sheep and pigs (both white and black); to the south the agriculture is mostly arable. To the east of Portalegre is the Parque Natural da Serra de São Mamede, a Nature Park Area that includes charming medieval villages that have changed very little from those days. In the south near Mértola is another Nature Park Area named Parque Natural do Vale Guadiana. This is mainly uninhabited and a contrast to the other above. To the west, the coastal strip that runs from the port of Sines down to Cabo de São Vicente is the Southwest Alentejo and Vicentine Coast Natural Park. The resident population of the Alentejo stands at around 759 000 (fourth quarter, 2008 – 2 700 less than the fourth quarter of 2007), with 49% men and 51% women. It is the most depopulated region in the country, representing over one third of national territory but only 7.1% of its population. It is also the region with the oldest population, 22.9% being 65 years of age or more (while the national average is 17.5%). The population is low and declining - especially to the east of Alentejo. Portuguese migrate from the villages to the towns and from the towns to cities beyond Alentejo. Virtually the only migration into Alentejo is from Northern Europeans looking to escape their overcrowded countries, either permanently or for sunny holiday retreats. The illiteracy rate in the region is quite high between the people older than 60 years, though there has been much improvement in recent years as generations have been replaced. The rate of coverage of pre-primary education is amongst the highest in the country. The area is commonly known as the "bread basket" of Portugal, a region of vast open countryside with undulating plains and rich fertile soil. With very few exceptions all the major towns are mainly reliant on agriculture, livestock and wood. There are several types of typical cheeses, wines and smoked hams and sausages made in Alentejo region, among these: Queijo de Serpa, Queijo de Évora and Queijo de Nisa (cheeses); Vinho do Alentejo and Vinho do Redondo (wines); and presunto (ham). Marble, cork, olive oil and mining industries are other important activities in the region. The Alqueva dam is an important irrigation and hydroelectric power generation facility which supports a part of Alentejo's economy. The region is the home of the world's most important area for the growing of cork. Cork-oak, known in Portugal as "sobreiro", has been grown commercially on the region for the past 300 years, with the areas between the trees typically given over to grazing, or on the more productive soils, to the growing of citrus fruit, vines or olives. As a consequence, a uniquely rich and varied eco-system has developed. The bark of the cork-oak is still harvested by teams of men using locally made hand-axes. No mechanical method has yet been invented that will allow the harvest to be achieved as effectively. The stripping of the bark is performed only in mid summer, when the bark can be removed more easily. The cork-oak is the only tree known that will allow this regular stripping of bark without damage. The harvest of one mature tree provides sufficient bark to produce about 4,000 wine bottle corks. The industry provides employment for about 60,000 workers. BBC, "Natural World: Cork - Forest in a Bottle", BBC2, broadcast 8.00 pm, Tuesday, 9th December, 2008.